- Competitive 2-4 player battles: Try to blend in with thieves while finding and stabbing other players. - A multitude of modes: Guns, smoke bombs, sheriffs, drunks, sandstorms, and more await you. - LAN & Local dynamic play: Play over LAN with up to three other players, plug in controllers to play locally, or do any combination of the two! - Cross-platform play: Play on PC, Mac, Linux, iOS, or Android devices. Any device with Thief Town installed can connect to any other device! - No menus: Connecting to other players has never been this simple! Thief Town is a multiplayer stealth action game for PC, Mac, Linux, iOS, and Android devices. 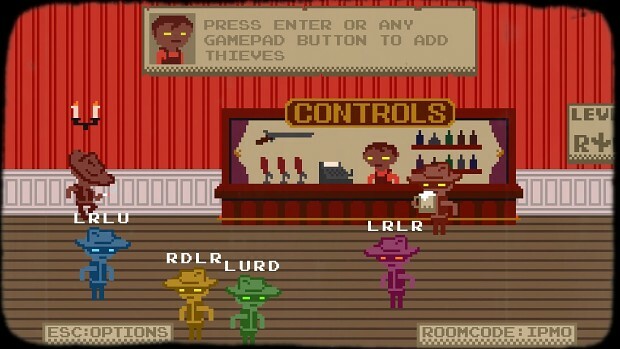 2-4 players control identical avatars (the “Thief”) in a single-screen arena (the “Town”) filled with other identical NPCs. Players must identify which NPCs are actually other players and stab them for points, without being discovered or stabbed themselves. New items and game modes are layered on as the game progresses, including pistols, smoke bombs, drunks, sheriffs, and giant tumbleweeds! 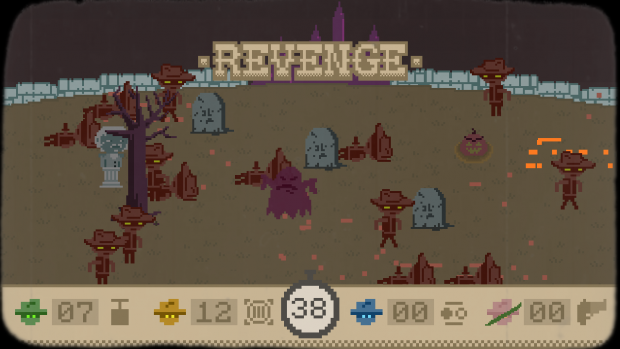 The game’s art style fuses "wild west"-inspired pixel art with the grain and charm of silent movies. Thief Town can be played cross-platform over LAN and includes controller support for multiple players. Spooky Town Update this Friday! I'm proud to announce that the new v1.1 update for Thief Town (titled Spooky Town) will go live this Friday (3/20). The update includes new content, features, gameplay tweaks and bug fixes. Here is a quick rundown of the major additions. A new version of the app will be released alongside Spooky Town, with a complete rework. Instead of acting as a separate screen, the app simply functions as a controller. 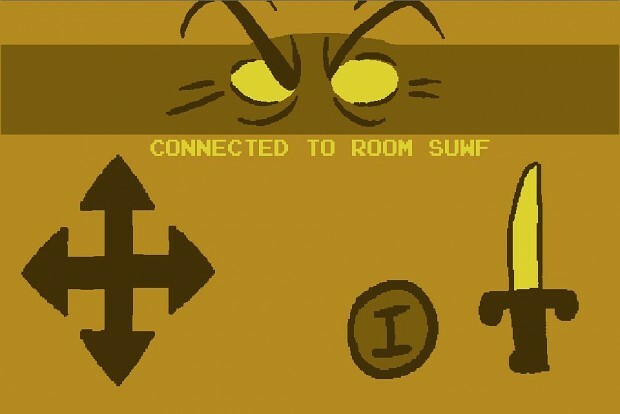 To connect, the desktop version of the game will generate a room code, and all you have to do is type this code in on the mobile end. This fixes all the connectivity and control issues with the original mobile app. 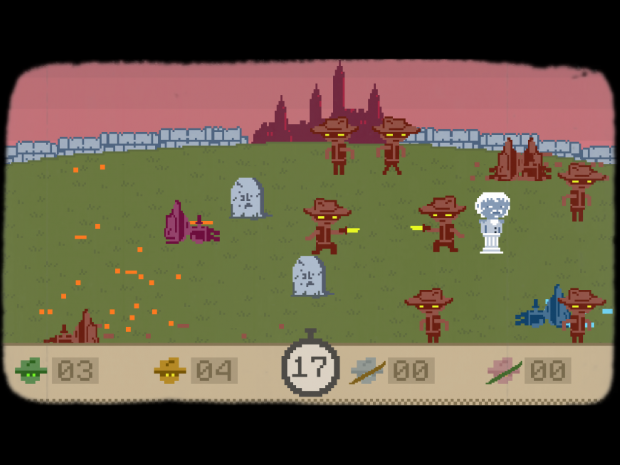 The game now features a new level, with both daytime and nighttime versions: the graveyard. I won't give away all the secrets but I will say there are ghosts, spooky statues, invisible showdowns, and... MORE. The graveyard features two new music tracks by ABSRDST, both of which are included in the OST folder. There are quite a few other changes, but I'll hold off on mentioning them for now.I will post a full changelog when the update is live. Depending on how this update is received, I may go back and work on adding even more content to the game. However, for the time being, I am working on porting the game over to consoles- specifically the PlayStation 4 and Xbox One. I expect these versions to go live mid-late summer. If you're interested in the console versions, or in any of our other projects, feel free to follow us on the social media links below. Thanks for playing!Keep those knives stabbing! Desura Release / Top 100 on Steam Greenlight! Thief Town is Out Now! Thief Town is out now on the Humble Store, Google Play, and the iOS App store! Only four dollars for infinite stabbing fun! Humble Store Release Date & More! Unfortunately the desktop release of the game has been delayed, however Thief Town Mobile will be out at launch for free! Where's the mobile version? I thought it was being released with the pc version. 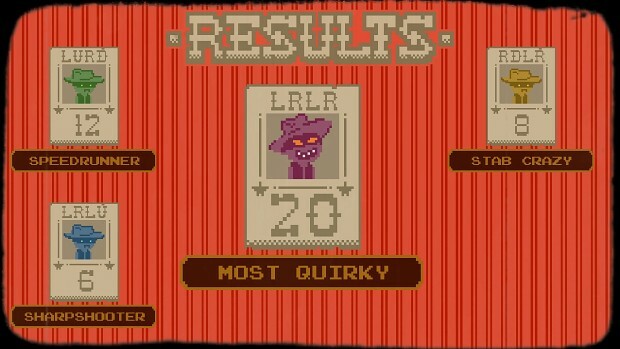 Its not on the play store.. great game though, worth the four dollars. Sorry about that, it went up a few hours later than the PC version did. Glad you like it! Does it mean we use the iPhone for controller or guide 'book' only? You can use it as a controller. Cool but where do I download? The game is releasing on Humble in a couple weeks, mobile version will be out about a month from now. Thanks for the interest!